My ego, sometimes larger than my fears, has persuaded me to do a lot of things over the years. Fear of heights? I suppressed my terror and went zip lining in Hawaii. Loved it. Fear of swimming? I went swimming with the dolphins. Exciting but didn’t love it so much. I’m surprised I didn’t rip the fin off that poor dolphin. I almost drowned the girl helping me to the center of the pool. I still see the fear in her eyes ten years later as I held a death grip on her…mind you I had on a life vest. While everyone else played with the dolphins, I was on the sidelines. It still hurts to think about it. I could’ve enjoyed it so much more if I knew how to swim. Fast forward to Spring 2015. I started thinking about learning to swim. I’m lying. Every year since President Clinton first became president I’ve thought about learning to swim. It became a running joke between my friend Steph and me. (That and kayaking but that’s another story.) Each year, I’d kind of look for swimming lessons and then drift to something else. It was getting ridiculous. I’m deep in the reading glasses phase of my life and still couldn’t swim. I live in a complex with two pools and had a membership at a gym that has a pool and offers swimming classes. I had no excuse. I was ready for swimming lessons…or so I thought. Swimming lessons at the gym became iffy. The teenager at the front desk was unsure when swimming lessons began. Their website wasn’t much help either. One thing I didn’t need was an excuse not to take swimming lessons but of course, it was right in front of me. Good thing the Jewish community center around the corner offered lessons. Their website was up to date too. Things were looking up again. I ordered my swimsuit and prescription goggles (yes, they sell them for us visually challenged folk) and filled out the paperwork. Once again, I was ready…or so I thought. The day before I planned to sign up for swimming lessons at the Jewish community center, I found out they were closing. Who closes a Jewish community center? Well, I thought, this is a sign swimming lessons weren’t in the cards for me. I put up my swim gear and figured I’d try again next year. Fall was coming and it was time to prepare for my winter hibernation. Besides, my baking business needed my time. Back to the drawing board…or so I thought. It’s January 2016. I started thinking about swimming lessons again… yes, in the dead of winter. As I said earlier, this feeling usually comes when the weather breaks in the spring. The stretch of warm weather in December threw me off. I started googling adult swimming lessons. 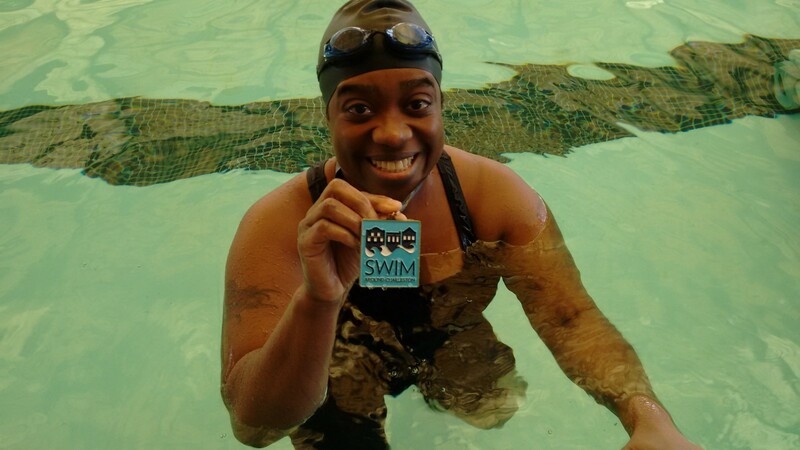 Swim Calm, a program that specializes in adults who have a fear of water, was at the top of the list and right here in Charleston, SC. Twenty hours of swims lessons and in two weeks, I would know how to swim. I mailed in my first payment. Monetary investment is a strong incentive for my follow through. First day: I was a bundle of nerves but also excited. Giving up 2 1/2 hours of my time after working all day was hard but I kept reminding myself, it’s only two weeks. The other students were already there when I arrived. The pool was full of people. My sensory overload was kicking into overdrive. Kathleen, our instructor, must have seen my “first day of kindergarten” look from across the pool. She jetted across and rescued me from myself. There were six of us in the class, some even older than me. Some, like me, had spent little time in the water while others had some experience in the water. Although we had various reasons for taking the Swim Calm course, being comfortable in water was a common goal. The first night we walked across a small, shallow area of the pool. I later learned they held the toddler swim lessons there. Talk about ego deflation. Although it was only 3 1/2 feet deep, it felt like it was 10 feet deep whenever I lost touch with the wall. That’s how deep my water fear ran. I’m glad I wasn’t the only one wobbling down the length of kid’s pool with a death grip on the edge. Later in the evening, we began to put our face in the water and learn to float. Kathleen would do this Jedi mind trick to help us move to the next level. She would say, “If you’re ready, you can put your face in the water a little.” The second night she said, “If you’re ready, but you don’t have to, you can come down to the deep end…only if you want to.” I’m not sure why but it always worked. Instead of focusing on goals, Kathleen reminded us learning how to swim was about having fun. That was hard for me to grasp. In the corporate world, creating goals was a way of life. I couldn’t wrap my mind around not having a goal in place to get to the next level. I became so focused on keeping up with everyone in the class…worried I’d never learn how to back float… afraid I’d never swim in the deep end…wondering if we had to dive at the last class. I was taking the fun out the class and sabotaging my own progress. I had to snap out of that mindset fast. By the beginning of the second night, I started taking my first strokes, which was so exciting for me. I took my time, making sure I was comfortable being under water. I was moving at my own pace and enjoying it. Some nights I was fine, others I wasn’t but I was ok with that. One step back, two steps forward. Kathleen said we were accomplishing something even when we thought we weren’t. So true. I loved that we were allowed to progress at our own pace. I admit the back float was never my strong point but I was OK with that. I never felt pressure from Kathleen or any of the other instructors to get it right. I wanted to do it but kept allowing my head to get in the way. One of my classmates, after watching me struggle with the back float, suggested another method for coming out of it. Our group was always supportive of each other, which was great when anyone had an off night. It was a great environment to learn not only from the teachers but also from others in the class as well. The last day of class, we could invite our family and friends to see our progress. My boyfriend can’t swim so it was important to me that he saw me swim. I overheard him tell Kathleen that watching me swim made him want to learn how to swim. Next was my mother, another one who can’t swim. I sent her the video Kathleen took of me swimming. My sister said after watching my mother’s reaction to the video, it wasn’t a matter of if but when she would be taking lessons. Mission accomplished. I’ve done many things that I’m proud of but not too many that put me in full snot bubble cry mode. Learning to swim made me feel that way. The first time I put my face in the water and was able to swim without fear is one of the top five things I’ve experienced thus far in my life. This must be the way people feel when they do something big like climb Mount Everest. You know you’re not the first but you did it and sometimes it’s a long road to get there making it even more rewarding. I’m glad I didn’t end up in traditional swimming classes because I don’t think I would be swimming. Nothing against traditional swimming classes, but sometimes when you’re either a little older or allowed yourself to build up a fear of water you need someone with a heavy dose of patience (and a touch of Jedi mind tricks) to teach you how to swim. There are many adults searching for either traditional classes or a specialized class like Swim Calm. Some could use a Swim Calm class but some, I believe, would be fine in a traditional class. A good way to decide which lessons would be best: if you’re the person who won’t go in any water beyond your ankles, you could benefit from Swim Calm’s classes. If you’re comfortable in the water at the beach or pool but want to learn how to swim, traditional swim class would be just fine. Next on my agenda: more swim lessons. Now I can enter a traditional beginner’s class at a mid-advanced level and continue my swim journey. Maybe even actually swim with the dolphins this time.